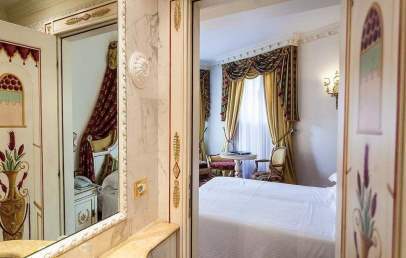 Splendidly set on the banks of Lago Maggiore, Villa and Palazzo Aminta looks out over the exclusive Borromean Islands and is just slightly more than 1 km from the centre of Stresa, a historic resort town. 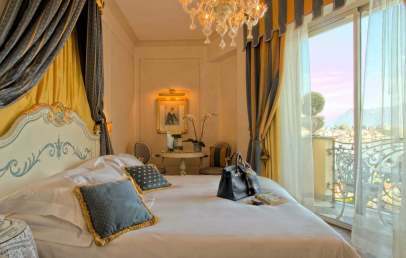 An exclusive gem of the collection ‘The Leading Hotels of the World’, Villa & Palazzo Aminta is a 5-Star Luxury Hotel with a stylish romantic ambience. 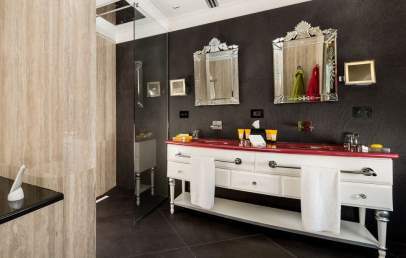 Heart and symbol of the hotel is the appealing Italian-style patio, around which open up the new halls and facilities. 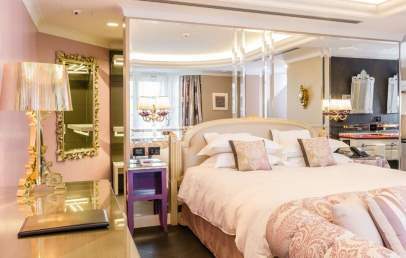 Interior rooms are a blend of balanced elegance in classic style with the irresistible appeal of precious materials. 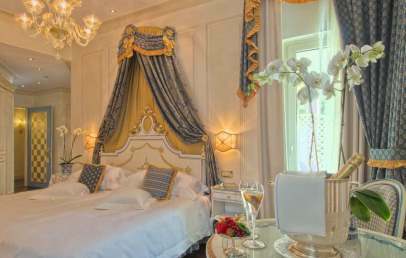 The lush, flowery garden, which drops down gently to the edge of the lake, hosts a fine pool with solarium, from which guests can enjoy a splendid view over the Borromean Islands. 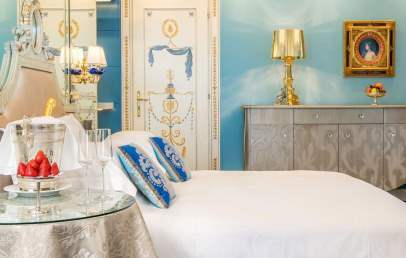 The 72 rooms of the hotel, set on 5 floors, vary as to colour of their décor, but all have splendid furnishings, hydro-massage tub, safe, minibar, satellite TV, balcony or private terrace. An extraordinary trip to the discovery of physical and mental well-being awaits our guests at the hotel wellness centre, the appealing Grotta Camelia which offers Turkish baths, an ice cascade, Aromarium, sensory and Scottish showers and fitness rooms with Technogym equipment. The hotel’s gourmet restaurant Le Isole is open every day for breakfast, lunch and dinner. 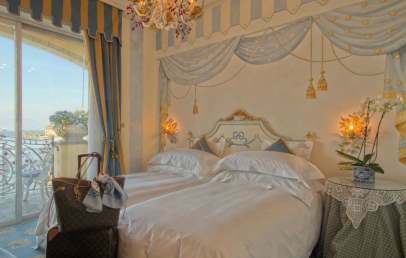 Guests can choose between the stylish interior areas and the splendid summer terrace, which looks directly over the lake. Excellent panoramic views are also offered by I Mori, a small Italian restaurant open in the evening, which welcomes guests to its fine Liberty-style gazebo in glass and wrought iron. Between them, these two restaurants offer the ultimate culinary experience, ranging from international dishes to local regional specialities, not forgetting a rich wine list with over 450 labels. 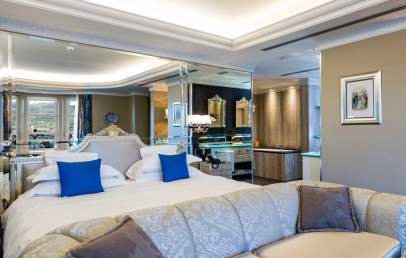 The cost of your stay includes use of the vehicle parking area and Wi-Fi connection, the shuttle bus to the centre of Stresa, minibar in your room with bottled water, soft drinks and beer, free access to the wellness centre, the fitness area and the pool and park. A supplement is payable for the laundry service and beauty treatments. Guests can utilize the private beach and hotel mooring facility for summer water sports such as parasailing, water ski and water scooter or as departure point for boat trips or visits to the islands. The Hotel offers a practical push bike service (no charge) to visit Stresa and the surrounding area. Small pets are welcome with a supplement of 35 € per day (sorry, no pets in the restaurant or pool area). 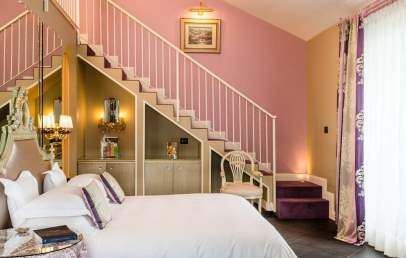 Single Attic mansarda rooms are located on fourth floor, very distinctive, with roof light, working desk with chair and are highly decorated with Murano glass lamps, handmade frescoes, marble bath with Jacuzzi tub. 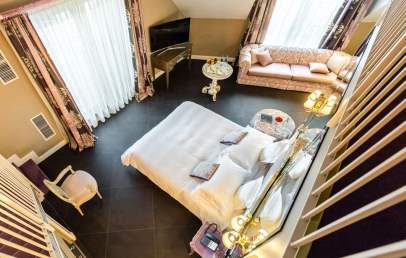 All Superior Park view rooms are in the real restful area of the resort, with private and large balcony or terrace overlooking the luxuriant vegetation of the gardens, and explosion of extraordinary trees and colored flowers. 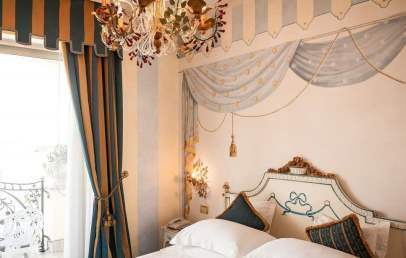 They are located from first to third floor, both in the Villa as well as in the Palazzo wing, and are equipped with working desk with chairs, Murano glass lamps, handmade frescoes and marble bath with Jacuzzi tub. Some of them can be connecting. 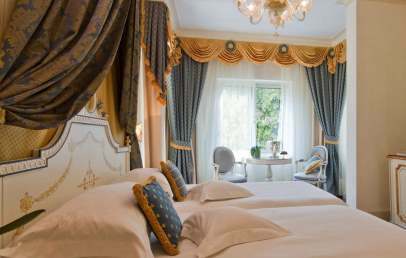 Deluxe Side Lake view rooms are located from second to fourth floor and have a big private balcony with an amazing view on the beautiful garden of the hotel as well as on Lake Maggiore. 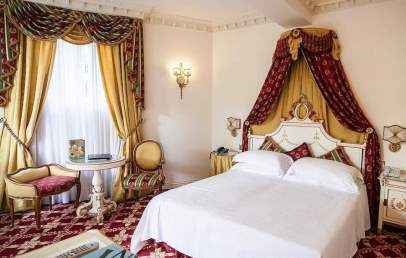 They have a working desk with chairs, highly decorated with Murano glass lamps, handmade frescoes, marble bath with Jacuzzi tub, soft bed linens in Egyptian cotton. Some of them can be connecting. 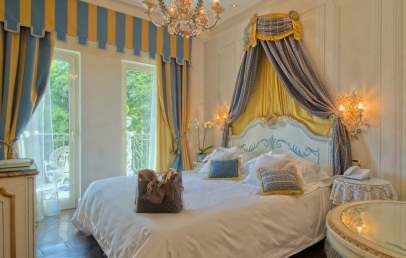 Villa Amintina rooms are located in a magnificent cottage in the garden, all on ground floor with private large patio overlooking the Lake Maggiore and the main Villa Aminta building. 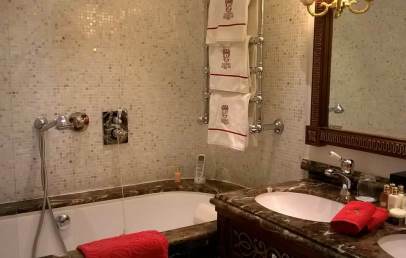 Equipped with a working desk and chairs and highly decorated with Murano glass lamps and marble bathroom with Jacuzzi tub, are suitable for relaxation and taking advantage of restful moments. Some of them can be connecting. 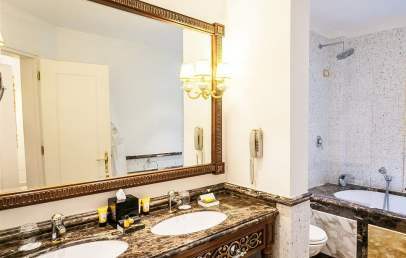 Located on second and third floor, all with private balcony overlooking the Lake Maggiore and the Borromean Islands, Deluxe Lake front rooms are highly decorated and personalized with handmade frescoes, marble bath with Jacuzzi and fresh flowers. They have a working desk with chairs. 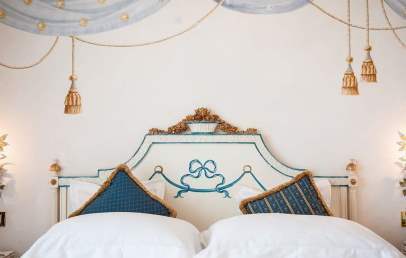 Light goose down duvets, soft bed linens in Egyptian cotton for restful and comfortable sleep. Some of them can be connecting. 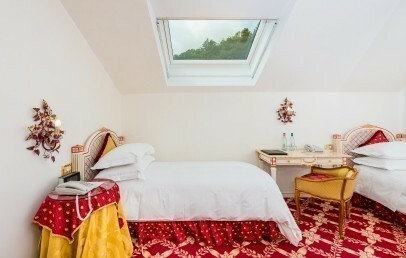 The Junior Suites are located on the first floor with a breathtaking view on Lake Maggiore and the Borromean Islands. 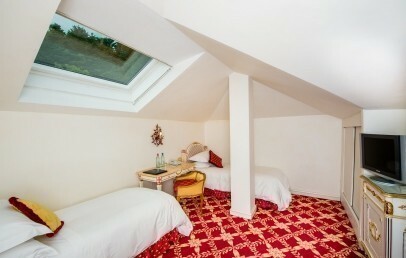 Spacious of about 38 sq.m., with a superb private terrace of approx. 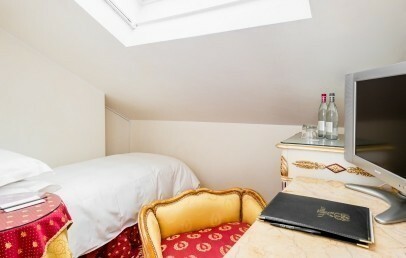 16 sq.m., fresh flowers and a living area highly decorated with working desk, chairs and sofa. 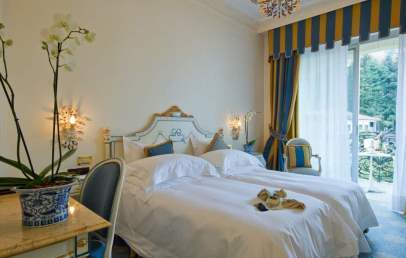 Light goose down duvets, soft bed linens in Egyptian cotton for restful and comfortable sleep. 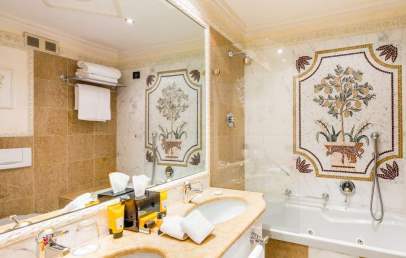 Marble bath with Jacuzzi and decorated with mosaics. Some of them can be connecting. 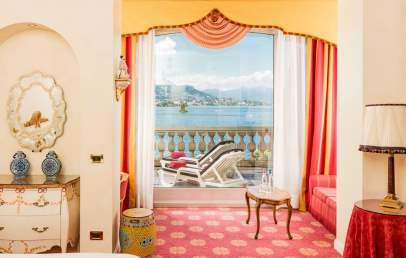 Flower suite of the lake are located on the fourth floor of the Villa with a big balcony overlooking the lake and the Borromean Islands. 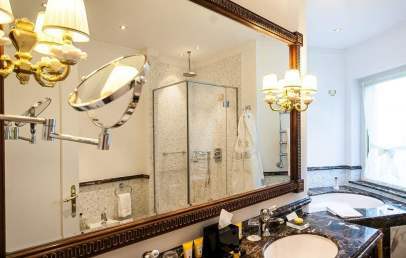 On the ground floor the main bedroom with light goose down duvets, soft bed linens in Egyptian cotton, fresh flowers and marble bathroom with Jacuzzi tub decorated with mosaics. Upstairs a nice and spacious living room overlooking the main bedroom with working desk, chairs and sofa that can accommodate to child up to 12 or a third adult. Some of them can be connecting. 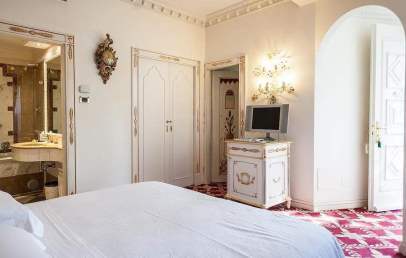 With breathtaking views on the Lake Maggiore and famous Borromeo Islands, the Belvedere Suites are all very spacious, with main bedroom and walk in closet, large living room, private balcony (14 sq.m.) 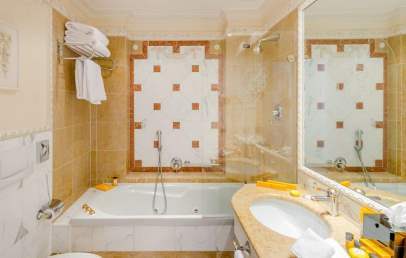 and cozy bathroom with Jacuzzi tub, marble sink and separate walk in shower. 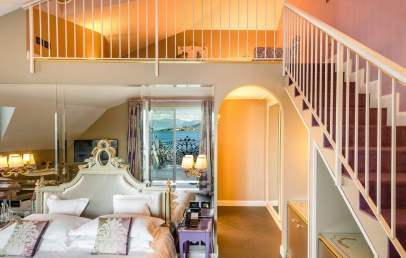 Can host up to four adults, be twin bedded and communicate with Deluxe Lake Front view rooms as well as with Liz Taylor Suites.